Last March, Futurism reported that Europe launched its ExoMars orbiter from the Baikonur facility in Kazakhstan. Aimed at looking for biochemical traces of life in Mars, it will study the methane present in the planet’s atmosphere. Now, the spacecraft has sent its first images of space. 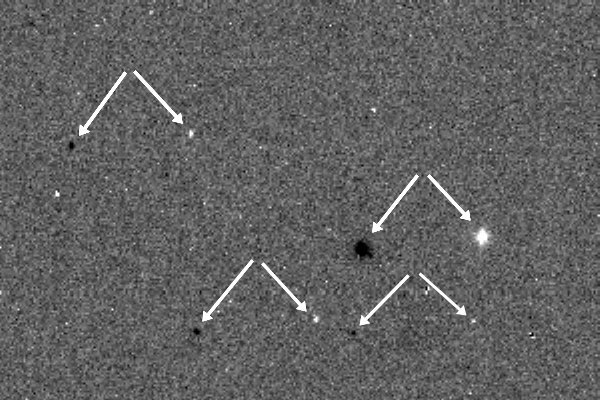 On April 7, the high resolution camera of ExoMars’ Trace Gas Orbiter was switched on, and transmitted its first images. The view shows a portion of the sky close to the southern celestial pole. This image is composed of two frames taken in slightly different directions by using the camera’s rotation mechanism. Subtracting one frame from the other reveals a number of equally offset positive and negative images of stars. Once on the Red Planet, ExoMars will be performing a multitude of tasks. Its TGO will analyze trace gases, particularly methane, present in Mars’ atmosphere. It will also analyze possible sources of these gasses, like volcanoes or biological life. The spacecraft is expected to reach the planet on 19 October.